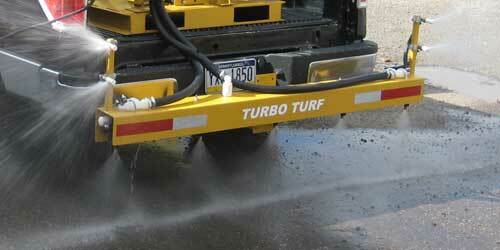 Options for Turbo Turf Brine Sprayers, hose reels, flow meters and more. One lane boom for gas powered units. Included turret assemblies each with one straight nozzle, one fan nozzle and one three stream nozzle. Mounts in 2″ receiver and has adjustable height. One lane boom for 12 Volt Electric powered units. Included turret assemblies each with one straight nozzle, one fan nozzle and one three stream nozzle. Mounts in 2″ receiver and has adjustable height. 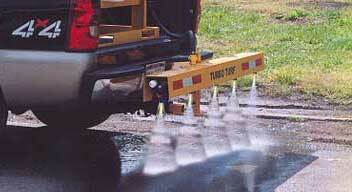 Three lane boom for Gas or Hydraulic powered units. Included turret assemblies each with one straight nozzle, one fan nozzle and one three stream nozzle and 2 Extender nozzles for each side. Mounts in 2″ receiver and has adjustable height. 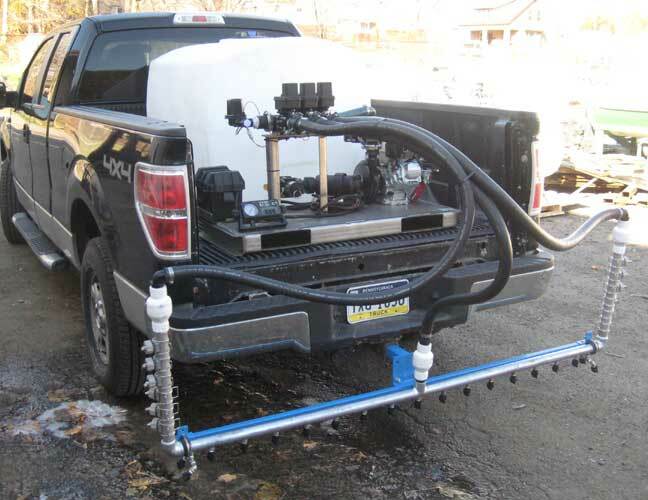 High speed three lane boom for Gas or Hydraulic powered units. 12 nozzles in center section and 6 adjustable nozzles on each side Mounts in 2″ receiver and has adjustable height. Three lane controller with master on off switch, individual controls for 3 lanes, pressure read out and pressure adjust on the go. This control is included in 3 lane packages. Replacement option includes valves and control. Three lane wireless controller controller. The remote will control each lane section and will rewind an electric hose reel. This control is the same price as the three lane wired control that is included in 3 lane packages. Three lane wireless controller controller. The remote will control each lane section and will rewind an electric hose reel. It will also start and stop the engine and adjust the throttle. It will not control the choke. 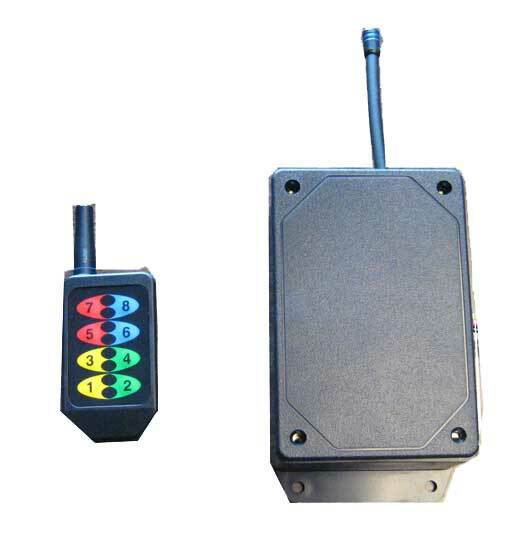 Three lane GPS controller. The Microtrak Roadmaster will control each lane section and adjust the flow as you speed up or slow down. It also has a readout for gallons sprayed. 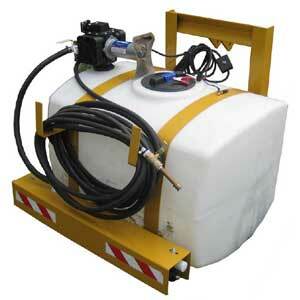 The Economy Hose Package includes 50 feet of rubber hose, hose holders on side of tank, he gun and nozzle. It may be added to most any unit. 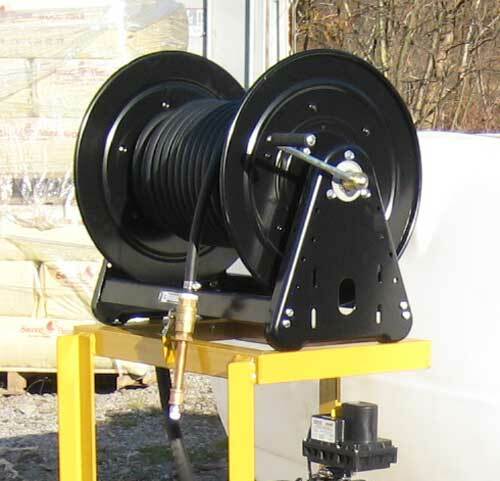 The ICHR manual rewind hose reel comes with 100 feet of hose, the gun and a nozzle. It is a great way to do sidewalks, steps and any hard to reach area. 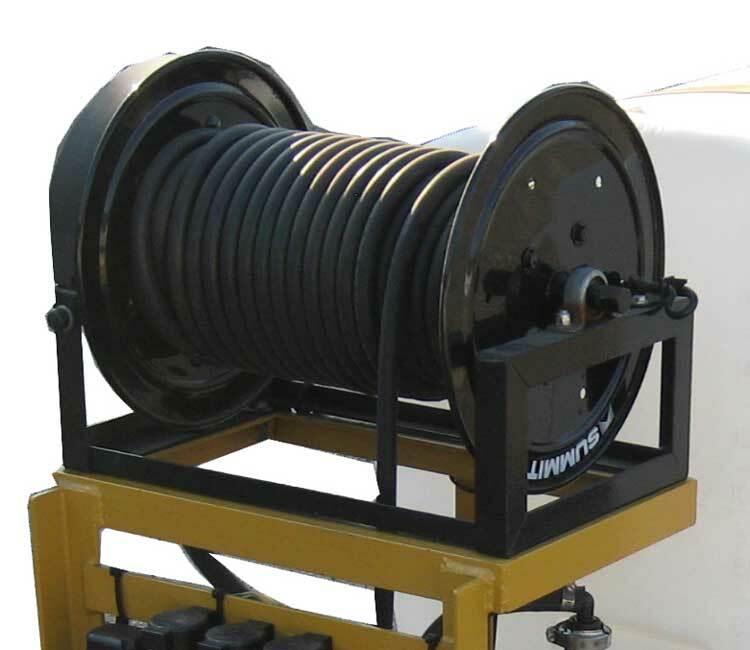 The ICEHR 12 volt electric rewind hose reel comes with 100 feet of hose, the gun and a nozzle. It is a great way to do sidewalks, steps and any hard to reach area. 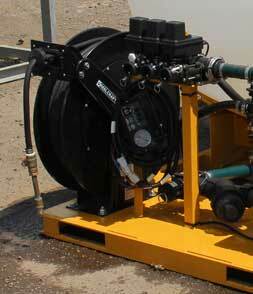 The ICHRSR spring rewind hose reel comes with 100 feet of 1/2″ hose, the gun and a nozzle. It is a great way to do sidewalks, steps and any hard to reach area. The inline flowmeter mounts on the sprayer just in front of the engine and pump. 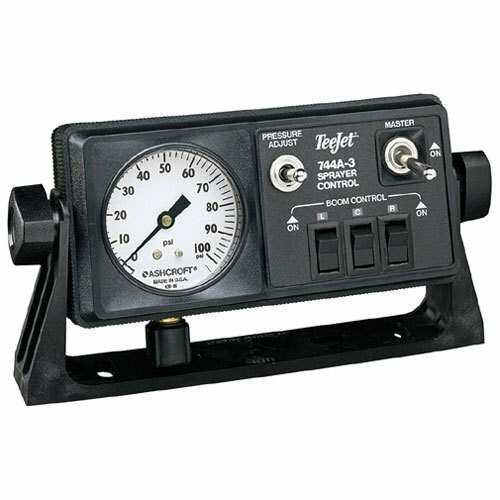 It has a digital readout This flow meter is available for any gas or hydraulic powered unit 300 gallons in size or larger. 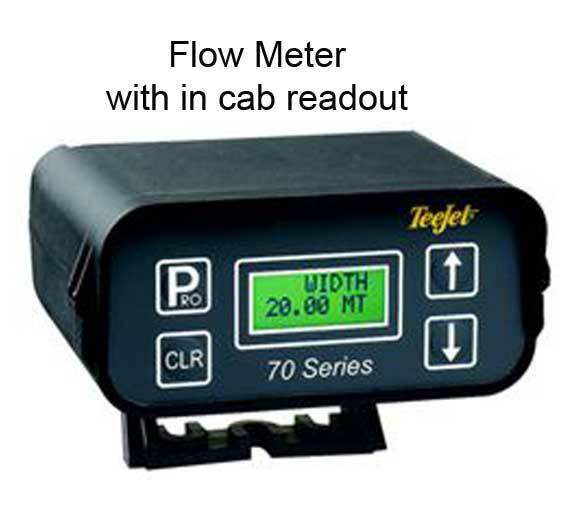 This flow meter has an in cab readout for ease of use. the flow meter sending unit mounts on the sprayer just in front of the engine and pump and has a cable running to the in cab digital read out. 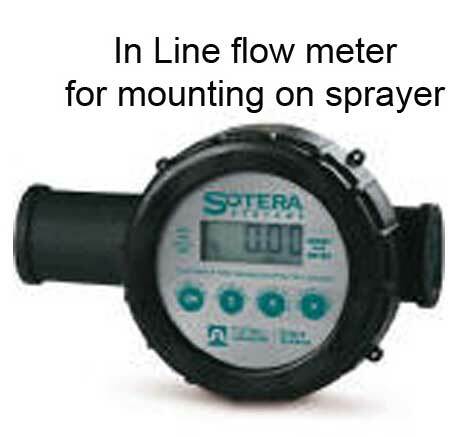 This flow meter is available for any gas or hydraulic powered unit 300 gallons in size or larger. The Surge Busters work like baffles to help minimize surging of liquids in the sprayer tank. Works with any tank with a 16″ opening. It requires 10 units for a 300 gallon tank, 16 for a 500 gallon tank, 24 units for a 750 gallon tank and 33 for a 1000 gallon tank. Assembly required but they are quick and easy to assemble.